ONTARIO – Noront Resources of Thunder Bay, ON, continues to test the footwall contact that hosts the Eagle’s Nest nickel-copper-platinum-palladium deposit near McFaulds Lake. Mineral occurrences on Noront property. The company conducted surface surveys on areas 1, 3 and 4 using IP and UTEM 5 methods, but none of the targets have been classified as massive sulphides. The same surveys are being implemented over area 6 that covers the basal contact of the Black Thor chromite deposit. The previous owner drilled the basal contact with results such as 1.6% Ni and 1.2% Cu over 1.8 metres and 5.7% Ni and 0.2% Cu over 0.35 metre. 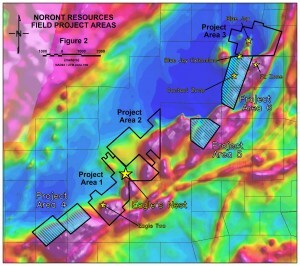 Noront has also proposed an exploration over area 5, the Big Daddy property, held 70% by Noront and 30% by KWG Resources. Of interest is the virtually unexplored footwall contact. Six months of geophysical tests are planned to be followed by drilling on quality EM targets that are identified. 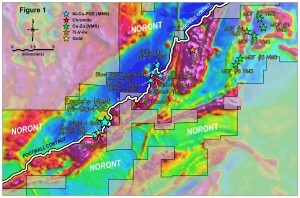 Please see www.NorontResources.com.